In this article, we teach you about 8051 addressing modes. 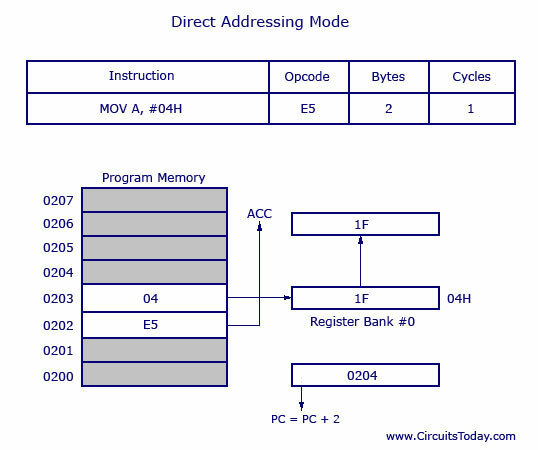 If you’re familiar with 8051 already, you may know an addressing mode is a way to address an operand. If you are new, don’t worry – we’ve covered every aspect about 8051 addressing modes in detail. Let’s begin the journey. Lets begin this article with a simple question. “What is an addressing mode ?“. A simple question always has a simple answer too. Addressing mode is a way to address an operand. Â Operand means the data we are operating upon (in most cases source data). It can be a direct address of memory, it can be register names, it can be any numerical data etc. I will explain this with a simple data move instruction of 8051. Here the data 6A is the operand, often known as source data. When this instruction is executed, the data 6AH is moved to accumulator A. There are 5 different ways to execute this instruction and hence we say, we have got 5 addressing modes for 8051. They are 1) Immediate addressing mode 2) Direct addressing mode 3) Register direct addressing mode 4) Register indirect addressing mode 5) Indexed addressing mode. 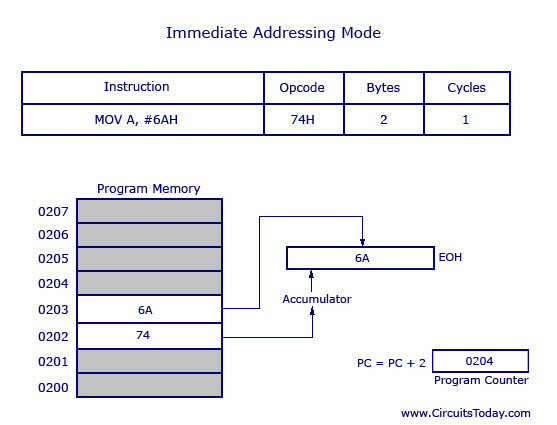 This addressing mode is named as “immediate” because it transfers an 8-bit data immediately to the accumulator (destination operand). The picture above describes the above instruction and its execution. Â The opcode for MOV A, # data is 74H. The opcode is saved in program memory at 0202 address. The data 6AH is saved in program memory 0203. (See, any part of the program memory can be used, this is just an example) When the opcode 74H is read, the next step taken would be to transfer whatever data at the next program memory address (here at 0203) to accumulator A (E0H is the address of accumulator). This instruction is of two bytes and is executed in one cycle. So after the execution of this instruction, program counter will add 2 and move to o204 of program memory. Note: The ‘#’ symbol before 6AH indicates that operand is a data (8 bit). If ‘#’ is not present then the hexadecimal number would be taken as address. This is another way of addressing an operand. Here the address of the data (source data ) is given as operand. Lets take an example. Here 04H is the address of register 4 of register bank#0. When this instruction is executed, what ever data is stored in register 04H is moved to accumulator. In the picture below we can see, register 04H holds the data 1FH. So the data 1FH is moved to accumulator. Note: We have not used ‘#’ in direct addressing mode, unlike immediate mode. If we had used ‘#’, the data value 04H would have beenÂ transferredÂ to accumulator instead 0f 1FH. As shown in picture above this is a 2 byte instruction which requires 1 cycle to complete. Program counter will increment by 2 and stand in 0204. 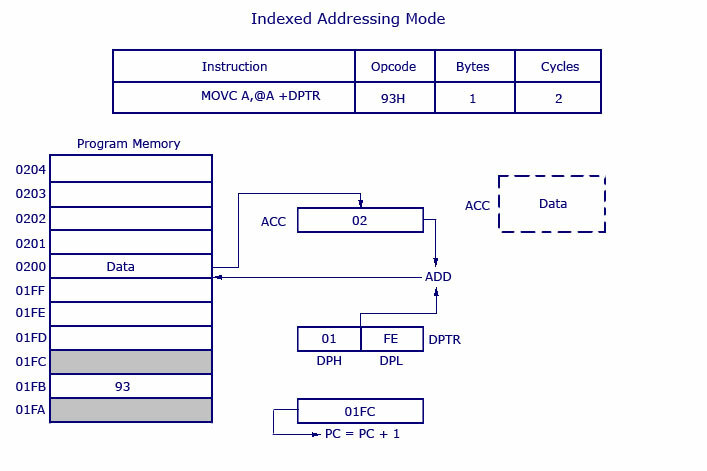 The opcode for instruction MOV A, address is E5H. When the instruction at 0202 is executed (E5H), accumulator is made active and ready to receive data. Then program control goes to next address that is 0203 and look up the address of the location (04H) where the source data (to be transferred to accumulator) is located. At 04H the control finds the data 1F and transfers it to accumulator and hence the execution is completed. In this addressing mode we use the register name directly (as source operand). An example is shown below. At a time registers can take value from R0,R1…to R7. You may already know there are 32 such registers. So how you access 32 registers with just 8 variables to address registers? Here comes the use of register banks. There are 4 register banks named 0,1,2 and 3. Each bank has 8 registers named from R0 to R7. At a time only one register bank can be selected. Selection of register bank is made possible through a Special Function Register (SFR) named Processor Status Word (PSW). PSW is an 8 bit SFR where each bit can be programmed. Bits are designated from PSW.0 to PSW.7 Register banks are selected using PSW.3 and PSW.4 These two bits are known as register bank select bits as they are used to select register banks. 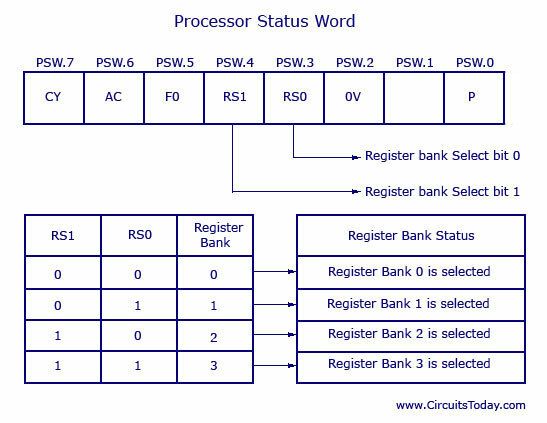 A picture below shows the PSW register and the Register Bank Select bits with status. So Â in register direct addressing mode, data isÂ transferredÂ to accumulator from the register (based on which register bank is selected). So we see that opcode for MOV A, R4 is EC. The opcode is stored in program memory address 0202 and when it is executed the control goes directly to R4 of the respected register bank (that is selected in PSW). If register bank #0 is selected then the data from R4 of register bank #0 will be moved to accumulator. (Here it is 2F stored at 04 H). 04 H is the address of R4 of register bank #0. Movement of data (2F) in this case is shown as bold line. Now please take a look at the dotted line. Here 2F is getting transferred to accumulator from data memory location 0C H. Now understand that 0C H is the address location of Register 4 (R4) of register bank #1. Programmers usually get confused with register bank selection. Also keep in mind that data at R4 of Â register bank #0 and register bank #1 (or even other banks) will not be same. So wrong selection of register banks will result in undesired output. Also note that the instruction above is 1 byte and requires 1 cycle for complete execution. 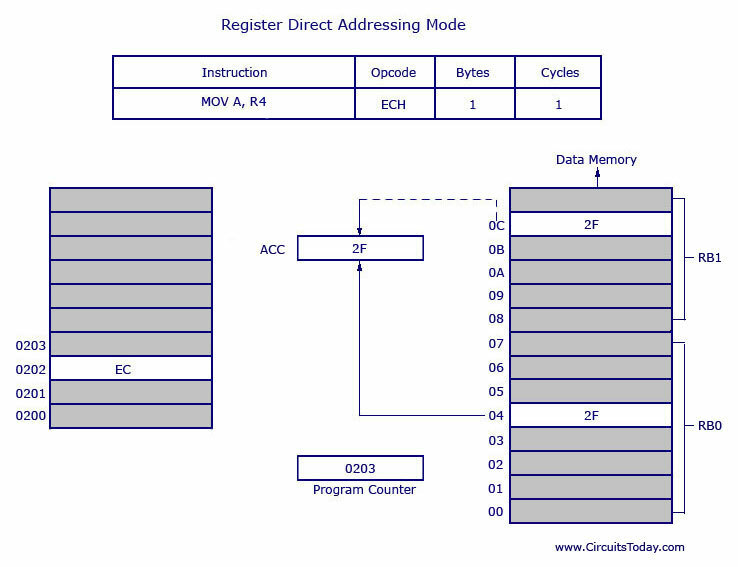 This means using register direct addressing mode can save program memory. So in this addressing mode, address of the data (source data to transfer) is given in the register operand. Here the value inside R0 is considered as an address, which holds the data to be transferred to accumulator. Example: If R0 holds the value 20H, and we have a data 2F H stored at the address 20H, then the value 2FH will get transferred to accumulator after executing this instruction. Got it? See Â the picture below. So the opcode for MOV A, @R0 is E6H. Assuming that register bank #0 is selected. So the R0 ofÂ registerÂ bank #0 holds the data 20H. Program control moves to 20H where it locates the data 2FH and it transfers 2FH to accumulator. This is a single byte instruction and the program counter increments 1 and moves to 0203 of program memory. Note: Only R0 and R1 are allowed to form a register indirect addressing instruction. In other words programmer can must make any instruction either using @R0 or @R1. All register banks are allowed. Well lets see two examples first. where DPTR is data pointer and PC is program counter (both are 16 bit registers). Lets take the first example. What’s the first impression you have now? The source operand is @A+DPTR and we know we will get the source data (to transfer) from this location. It is nothing but adding contents of DPTR with present content of accumulator. This addition will result a new data which is taken as the address of source data (to transfer). The data at this address is then transferred to accumulator. Â Take a look at the picture below. The opcode for the instruction is 93H. DPTR holds the value 01FE, where 01 is located in DPH (higher 8 bits) and FE is located in DPL (lower 8 bits). Accumulator now has the value 02H. A 16 bit addition is performed and now 01FE H+02 H results in 0200 H. What ever data is in 0200 H will getÂ transferredÂ to accumulator. The previous value inside accumulator (02H) will get replaced with new data from 0200H.Â New data in the accumulator is shown in dotted line box. This is a 1 byte instruction with 2 cycles needed for execution. What you infer from that? The execution time required for this instruction is high compared to previous instructions (which all were 1 cycle). The other example MOVC A, @A+PC works the same way as above example. The only difference is, instead of adding DPTR with accumulator, here data inside program counter (PC) is added with accumulator to obtain the target address. I hope you now have a clear cut understanding of 8051 addressing modes. If you have any doubts or need any additional clarifications, please post your comments below. I will answer them. in indexed addressing mode we are adding content of DPTR( i.e. 16 bits ) with content of ACC( which is of 8 bit) and result is stored in ACC which will be 16 bit. How 16 bits are stored in 8 bit ACC? Note: We have not used â€˜#â€™ in direct addressing mode, unlike immediate mode. If we had used â€˜#â€™, the data value 04H would have been transferred to accumulator instead 0f 1FH. sp please clarify the same. superb article! Very clear explanation of 8051 addressing modes! And what about immediate,relative,absolute and long addressing? can you help me to solve indexed addressing mode..
if we have take data at address 0300H then FINAL AnS is store in 0300h? tell m exact execution of indirect addresing mode,.,. what does c mean im movc? As u can check, MOVC instruction is used to moved a byte from the Code memory to Accumulator. Therefore C in MOVC stands for Code. can a programmer make up a new addressing mode in 8051? why are we supposed to add accumulator with DPTR/PC? Is there any specific reason? (in the instruction MOVC A, @A+DPTR and MOVC A, @A+PC)…. what role does accumulator play in this instruction? 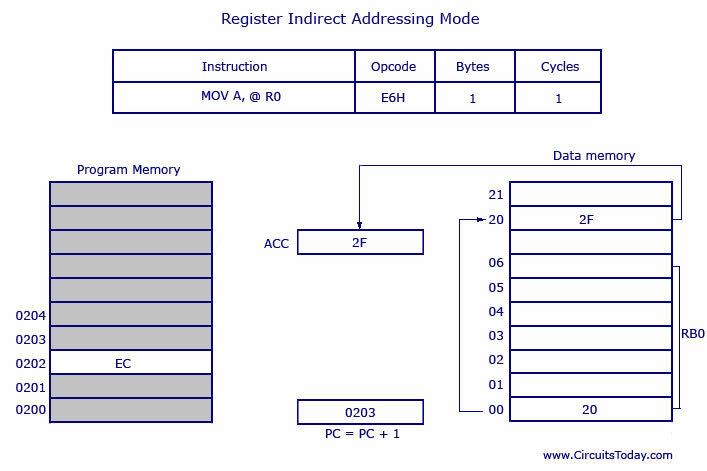 register direct addressing mode and register indirect addressing modes are loooking to be similar. what will be the difference?? @Balalogeshwari – They are entirely different. Register indirect addressing mode can be compared to be sth similar to the concept of “pointers” in C and C++ You may read the article carefully once again. If register R0 holds the address 20H, and we have a data 2F H stored at the address 20H, then the value 2FH will get transferred to accumulator after executing this instruction. Got it? sir what is the use of 4 reg banks as we can only use one at a time. There you can find many articles and circuits related to 555 timer.